PASTIC Sub Centre Lahore, organized one-day workshop with collaboration of Pakistan Industrial Technical Assistance Centre, (PITAC) Lahore, on “Plagiarism: how do I avoid it? & use of Turnitin” on December 18, 2018 at Pakistan Industrial Technical Assistance Centre, (PITAC) Lahore. 35 participants form PITAC, others universities and libraries participated in this workshop. Mr. Ali Raza Khan, Deputy Director (STI), PASTIC Sub Centre, Lahore introduced PASTIC its services and achievements. Mr. Nadeem Sohail, Manager Library, organized technical session theoretically and practically, on Plagiarism: How do I avoid it? & use of Turnitin, for researchers. At the end, shields were distributed among guests and resource persons, and the participants received their certificates. 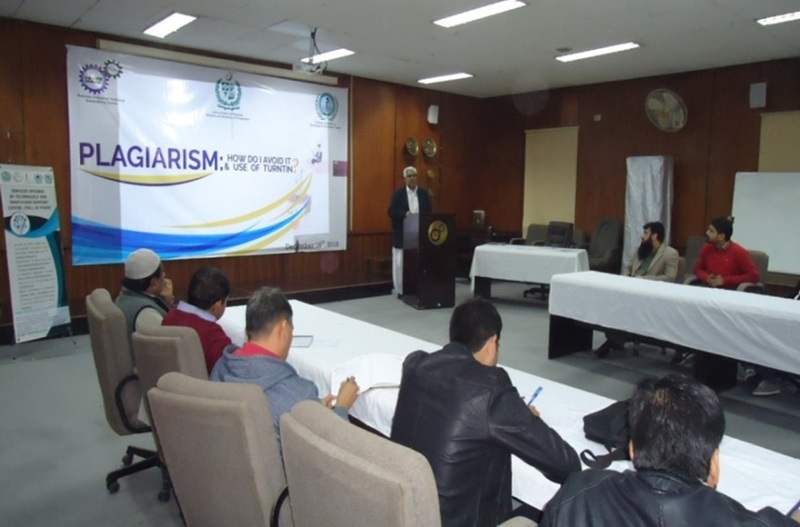 Mr. Ali Raza Khan Deputy Director (STI), highlighting the objectives of the PASTIC the importance of workshop for the participants on Plagiarism: How Do I Avoid It? & Use of Turnitin at PITAC, Lahore.